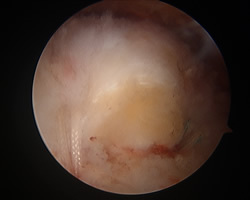 Rotator cuff tears are common athletic injuries, and are often best treated with shoulder arthroscopy, a minimally invasive surgical approach that reduces post-operative pain and reduced recovery time. Continue reading to learn more, or schedule an appointment with Dr. DuBois to find out if you are a candidate for arthroscopic rotator cuff repair. Because of the shoulder’s delicate anatomy, athletes engaging in repetitive upper body motions or upper body training are at a greater risk of experiencing shoulder problems. Repetitive, high-energy activities, such as lifting heavy weights overhead or pitching fastballs, exert high amounts of force on the shoulder and eventually damage the supporting components. Many athletes will experience problems with their rotator cuff, a set of muscles responsible for moving the arm through its wide range of motion. Some rotator cuff injuries can be treated effectively through conservative treatment options, such as physical therapy and rehabilitation, activity modification, and anti-inflammatory drug treatment (NSAIDs, such as ibuprofen or tylenol). 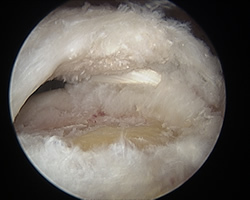 Other patients may opt for arthroscopic surgery, which tends to produce quicker results without many of the negative post-operative side effects associated with traditional open surgery. To better understand how rotator cuff damage occurs, it is helpful to understand the basic anatomy of the shoulder joint. Continue reading to learn about how the shoulder’s components work together to move and rotate the upper arm. The shoulder is a ball-and-socket joint, much like the hip, with the main joint comprised of two bones: the humerus, or upper arm bone, and the scapula, or shoulder blade. The rounded top of the humerus (humeral head) fits within a shallow socket on the scapula known as the glenoid fossa, forming an unstable joint that is commonly dislocated. A ring of cartilage, known as the labrum, lines the lip of the socket to help prevent dislocation and provide additional depth. A set of muscles, collectively known as the rotator cuff, attach to the main shoulder joint and hold the humeral head within the glenoid fossa. The four muscles begin at the humeral head and attach to the shoulder blade, playing a key part in lifting and rotating the arm through its wide range of motion. The rotator cuff is integral in most upper body activity, and when injured, weakens the shoulder significantly. An injured rotator cuff limits a patient’s range of motion, causes pain during movement, and makes simple tasks, such as buttoning a shirt, painful and difficult. While conservative treatments avoid complications that might arise from surgery, they also limit the rotator cuff’s potential for increasing its strength. Because the injury is not being actively treated, the size of the tear may increase over time, as well. Additionally, many patients may not see activity modification as a feasible solution due to personal concerns. 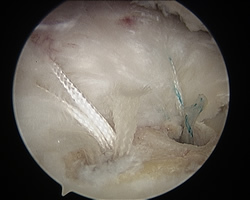 When surgery is indicated, rotator cuff tears are best treated arthroscopically. This minimally invasive surgical approach allows athletes to return to the playing field more quickly with less post-operative pain. Shoulder arthroscopy is typically performed on an out-patient basis, meaning patients can return to their homes the same day of surgery to rehabilitate more comfortably. Arthroscopy allows for the benefits of minimally invasive surgery because of its novel use of fiber-optic camera technology. Shoulder arthroscopy involves the use of an "arthroscope," a tiny camera that sends real-time images to a monitor in the operating room. Once the surgeon makes a small incision (just large enough to insert the arthroscope), the camera provides an internal view of the shoulder without splaying open the joint. Once the arthroscope is inserted, the surgeon can perform the operation to repair the torn rotator cuff, as well as remove any floating pieces of cartilage that may be causing pain. The surgery requires significantly less invasion and tampering compared to open surgery, resulting in a less painful procedure with hastened rates of recovery. Dr. Benjamin DuBois is one of Southern California’s leading orthopedic surgeons, and has received specialized training to treat patients with sports injuries affecting the shoulder. As a fellowship-trained surgeon specializing in shoulder replacement and rotator cuff disorders, Dr. DuBois is one of the most knowledgeable shoulder surgeons in the San Diego area, and acts as a regional thought leader by training other physicians and surgeons in the diagnosis and treatment of shoulder injuries. Schedule an appointment to speak with Dr. DuBois at his La Mesa offices, located just 12 miles from Downtown San Diego.